Nebraska U.S. Republican Senator Ben Sasse tells reporters in Lincoln that it is crucial that President Trump nominate someone to replace Attorney General Sessions who will acknowledge the importance of the Mueller investigation finishing its course. Senator Sasse says no one should be confirmed as attorney general, who believes the job of attorney general is partisan. Sasse says that it is not and adds the Attorney General should be color blind. Sasse says that no one single narrative comes out of the election on Tuesday. He says that what we saw was suburban voters moving farther toward the left and against the Administration….. And rural and Red State voters affirming their support for President Trump. Senator Sass says we saw red states getting redder and blue states getting bluer. 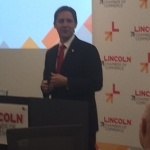 Senator Sasse visited with reporters after addressing a Lincoln Chamber of Commerce gathering.